Akram was 7 years old when he learned how to behead a person. The lessons started with pictures that showed the way to decapitate an enemy. He then graduated from drawings to a town square, where he witnessed a real beheading. 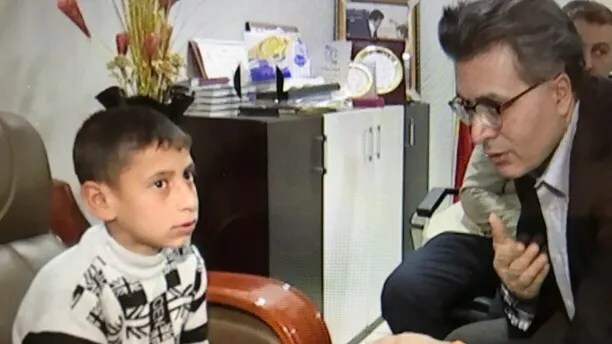 Akram, now 8, was a prisoner of ISIS for 2 ½ half years. In captivity, he underwent brutal training, including torture, as he learned to become a child soldier. Freed by Kurdish fighters two months ago, along with a younger brother and sister, he is now in a refugee camp 25 miles east of Duhok, a Kurdish-controlled city in northern Iraq. Their mother is still in captivity. The nightmare began when Akram and his mother were shot while fleeing ISIS invaders. Akram was taken to the ISIS-controlled city of Mosul, where doctors removed five bullets from his back. Jan Kizilhan, a 50-year-old German psychologist of Kurdish background, treated Akram after his release. During his first three months in captivity, he was regularly beaten if he didn’t learn his lessons about Islam. He was forced to study Arabic in order to read the Koran. Akram is a Yazidi, a member of an ancient non-Muslim minority in Iraq. In 2014, ISIS attempted to massacre the Yazidis in the Sinjar region of northern Iraq, charging that they are infidels who must be destroyed. Jan Kizilhan, a 50-year-old German psychologist of Kurdish background, treats victims of ISIS torture. In a recent telephone interview, he spoke about Akram’s unimaginable childhood. Kizilhan said that Akram is often unable to sleep because of nightmares. He also beats his younger siblings, an expression of underlying anger at his brutal treatment in ISIS captivity. Kizilhan said Akram is already showing signs of post-traumatic stress disorder, an affliction of soldiers who fight in Iraq and Afghanistan. Kizilhan said he has to speak very slowly to Akram, and must frequently repeat things. When interviewed by Kizilhan, Akram bites his nails. His eyes dart around the room, without making human contact. The scrawny boy with close-cropped brown hair tells Kizilhan that his captors often threatened to cut off his hands. He then runs his fingers around his neck and says they also repeatedly warned him that they would decapitate him if he were defiant during weapons training. He has learned to fire a variety of weapons. ISIS would only let Akram see his mother when he showed progress in becoming a good soldier. The first step toward helping Akram is to build trust, said Kizilhan, to show him that there is an alternate society where barbaric behavior is not the norm. Naji Hamo, a psychologist who is Kizilhan’s student, will undertake the effort to build this trust. Kizilhan has brought more than 1,000 severely traumatized Yazidis to a treatment facility near Stuttgart in the German state of Baden Wurttenberg, which has allocated $107 million over three years to operate the treatment center. Reflecting on the history of man’s cruelty, Kizilhan cited the Turkish massacre of the Armenians and the millions of Jews gassed by the Nazis during the Holocaust. Then he spoke of the personal emotional toll he experiences when he witnesses the destruction of Akram’s childhood. He recalls another tragic victim of ISIS, a mother who refused to convert to Islam and refused to learn Arabic, or read the Koran. ISIS punished her by placing her 2-year-old daughter in a black box in the torrid August heat. Despite the mother’s sobbing pleas, ISIS would not let the girl out of the box. On the seventh day, when the child was near death, the bearded ISIS guard broke her back in two places. She died two days later. The mother cried uncontrollably when she told Kizilhan this story. This is the question that Kizilhan asks himself, but he finds no answer. Donald Snyder was a news producer at NBC for 27 years and has been a freelance writer since his retirement. He specializes in Germany and Eastern Europe.